The accounting equation, assets equals the combined value of liabilities and equity, is the foundation of accounting and double entry system. The equation signifies that all assets are financed either by borrowing funds or with shareholders invested capital. The general form of accounting equation is mentioned below. 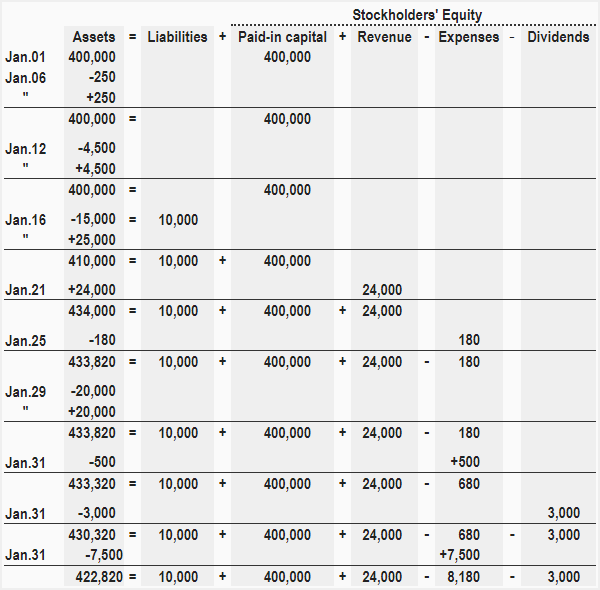 The accounting equation is further extended mainly through the equity point of view. 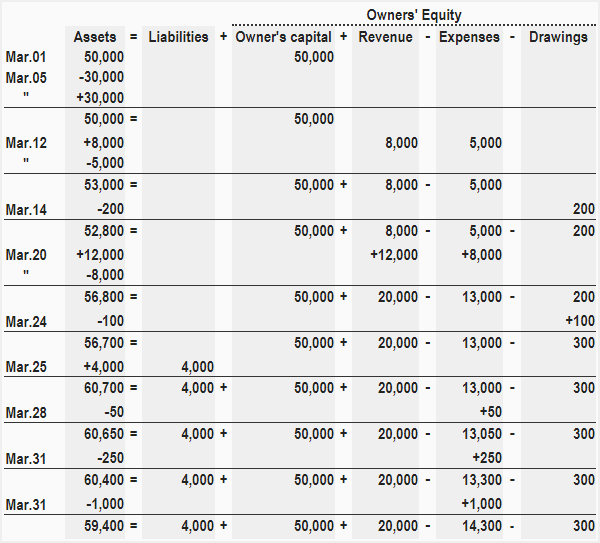 The equity is split into owner’s capital, owner’s withdrawal, revenue, and expenses. The basic reason behind expanding the equation is to distinguish between the increase in equity due to economic events, i.e. capital contributions by owners or shareholder’s, and the profit retained from the previous operations of the company. Mar. 01: Kathy invests $50,000 in the business. Mar. 05: She purchases sports items costing $30,000. Mar. 12: She sells sports items to a retailer for $8,000 cash, the cost of the sports items sold is $5,000. Mar. 14: Kathy takes $200 cash for her personal use. Mar. 20: She sells sports items to a retailer for $12,000 cash, the cost of the sports items sold is $8,000. Mar. 24: She gifts some sports items to a friend. The cost of gifted items is $100. Mar. 25: Kathy purchased sports items on credit $4,000. Mar. 28: She pays $50 to an organization as charity. Mar. 31: She pays monthly rent of the shop amounting to $250. Mar. 31: She pays salary to the salesman amounting to $1,000. Required: How would above transactions impact the accounting equation of Kathy Sports Point? Expand the basic accounting equation to show the various components of equity. Jan. 01: 20,000 shares of common stock were issued @ $20 per share. Jan. 06: Purchased office supplies $250. Jan. 16: Purchased business car for $25,000. Paid $10,000 cash and issued a note for the balance. Jan. 21: Billed clients $24,000 on account. Jan. 25: Paid utility bills for the month of January $180. Jan. 29: Received $20,000 cash from clients billed on January 21. Jan. 31: Paid office rent for the moth of January $500. Jan. 31: Cash dividend paid $3,000. Jan. 31: The salary for the month of January was paid in cash $7,500. Required: Sow the effect of above transactions on expanded accounting equation of Sun Service Inc?